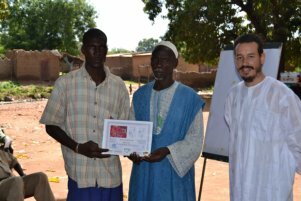 In October 2015, the mayor of Sukumba (Koningue commune, Mali) awarded 50 certificates to farmers who led collaborative fertility trials with ICRISAT, AMEDD, IER, MANOBI, UCL, UdS, WUR, and other STARS partners. These awards were no ordinary certificates: alongside the usual recipient name and official seal, they featured the boxplot outcome of fertilizer application on crop yield and biomass, AND a map of the crop response as seen from satellite – right inside their individual field. This restitution event, organized on Sukumba’s main square, led to several ‘aha!’ moments when breakout groups associating farmers, extensionists and scientists connected particular crop responses to the actual management decisions made by individual farmers. For example, farmer #46, Mr. Usman Sania Berthe, expressed dismay at the poor response of his cotton crop to the application of Sabunyuman fertilizer, compared to responses observed on the fields of his fellow cotton growers. The discussions led him to remember that he was late in applying the recommended dose at the recommended date – and a commitment to stick by the trial suggestions the following season. ICRISAT scientist P.C.S. 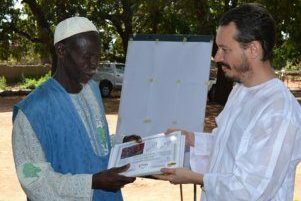 Traore officially transmits the set of certificates to the Sukumba Village Chief, Mr. Yakuba Berthe for the award ceremony to collaborating farmers. Mr. Boli Burama Berthe, a farmer in Sukumba, receives his award from Mr. Yakuba Berthe. The certificate includes a map insert of the crop response to fertilizer application, as seen by the WorldView2 earth observation satellite, and box-plots quantifying yield and biomass changes over corresponding plots. In and of itself, these certificates may appear as benign manifestations of a well-honed engine humming on the traditional, comfortably linear research-extension-farmer continuum. However, if you read between the lines, they are harbingers of the second revolution of World Agriculture: satellite imagery will, very soon, provide responsive, hands-on, affordable diagnostic tools to hundreds of millions of farmers, smallholders or not, served over mobile networks. STARS privileged private partner MANOBI S.A., a leading specialist in mobile2web knowledge solutions is accelerating the interconnection and content-generating feedback loops between satellite data streams, smallholder farmer networks and input suppliers. Developed by MANOBI as part of the project, the STARS-One android app provides a glimpse of what next-gen, franchised farm advisory services and farmers themselves will have at hand, to help make key decisions on how to optimize resource use. For example, farmers will decide whether or not to apply fertilizers given the imminence of rainfall events, when and where to apply it for highest returns, and whether or not to seek expert advice when witnessing unexpected patterns in canopy response that may lead to the identification of other localized abiotic or biotic production constraints. Input suppliers will marshal out a complete set of customized farm-gate services developed from deep, granular knowledge of farm endowment levels, soil variability patterns, and maps of probable returns on investments for particular field and crop types – triggering a cascade of bundled services from micro-finance and micro-insurance sectors. 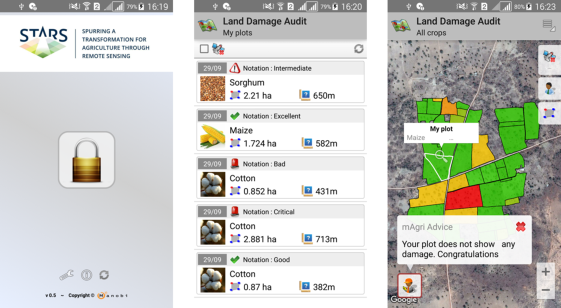 Screenshots from the STARS-One Android app, developed by MANOBI, ICRISAT and other STARS partners to stream remotely sensed diagnostic metrics on crop performance, soil fertility, and yield gaps for individual smallholder fields. Here, DigitalGlobe time series from the WorldView2 sensor were used. One particular area of rapid progress resides in the imminent ability to map yield gaps in smallholder landscapes based on remote sensing metrics that provide users with a cost-effective means of quantifying where and how incremental and/or transformative solutions should be deployed. An exemplar spin-off activity from STARS is the selection of Mali as the third country pilot worldwide for the Sen2agri project (after Ukraine and South Africa), which aims to provide free monitoring of crop type and status down to 10m resolution exploiting the unprecedented 5-day repeat cycle of ESA’s Sentinel2 sensor, over an initial extent of 500,000 km2. This development, arising from the STARS partnership between ICRISAT and UCL, also the Sen2agri project leader, will bring a revolution in the provision of imagery to farmers, effectively unlocking the überization of agriculture – in essence, the next Green Revolution. All it will take is the capacity to interpret and transform terabytes of streaming imagery into meaningful advice, something farmers, MANOBI, ICRISAT, and other STARS partners are deciphering right now – with STARS-One. Aiming to deliver it directly from the stars… and straight to the roots. Pierre C. Sibiry Traore is Senior manager – GIS, based in ICRISAT-Bamako, Mali.